Hou Quan, Shaolin Kung fu pictographic boxing in boxing. Shaolin Hou Quan is boxing to monkey shape monkey state and the offensive and defensive techniques to fuse into. 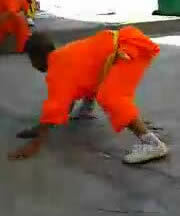 Shaolin Hou Quan imitate monkey body shrink neck, shoulders, requirements, chest, back, recoil, elbow, wrist, knee. Manipulation imitating monkey picking, climbing, have Diao, mining, grasping, buckle method. Step step, channeling, and imitate monkeys, with toes step, small step, cross step etc.. Eyes to focus like a monkey like. Martial art, mainly using the upper limb, pinch hit block, etc.. His legs are not many, only I used to tie up the leg, leg. The motion characteristics of monkey to sensitive fickle, crisp shot. Modern monkey absorb some vacated flip (such as the flip side, roton etc.) and roll rotation movements into routine. Monkey Quan routine general imitate monkeys out of the hole, peep, picking, fight, play, frightened channeling, plots into hole etc..
Hand Shaolin Hou Quan, palm, hook three, are different from boxing. Boxing: four fingers curl, the thumb button attached to the index finger second knuckles, boxing heart is void. Palm. Natural fingers unbend and approach, the palm slightly concave. Hook: wrist flexion, finger roll of flexion, the thumb and forefinger buckle sticking into the ring, hands empty, the little finger buckle sticking wrist.